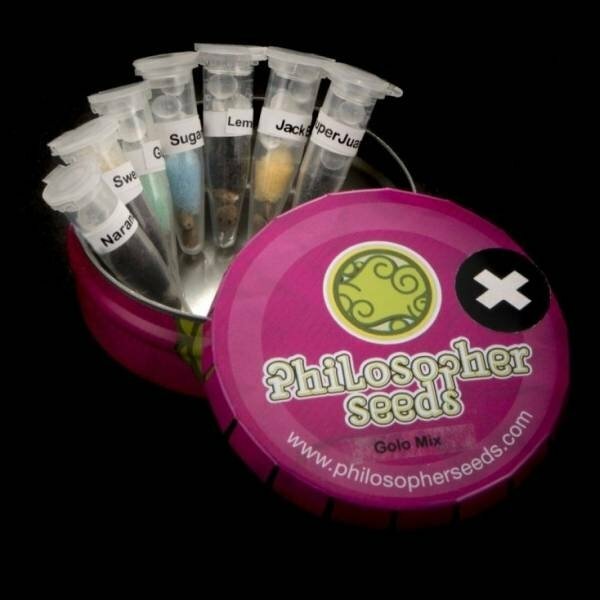 The Philosopher Seeds Golo Mix contains 7 different strains of feminized cannabis, two seeds each. A perfect choice for growers with limited space that want to know as much as possible about the rich world of marijuana strains. Enjoy both Sativa and Indica dominant, feminized strains in Golo Mix! Orange Candy – is a strain created from a cross between ‘Naran J’ and ‘Tropimango’, while the first species, ‘Naran J’ is a hybrid of ‘New York City Diesel’ and ‘Morning Glory’, obtained by their collaborator – Reggae Seeds. An eligible species for SOG technique due to its vigorous development of central bud and short internodes. Orange Candy's taste is often described as orange flavoured without the fuel aftertaste, characteristic for the diesel species. Sugarpop – another successful result of Philosopher’s Seeds collaboration with Reggae Seeds. The created hybrid was obtained from a cross between ‘White Russian’ and ‘Kalijah’ which was additionally mixed with famous ‘Jack the Ripper’. Thanks to the breeding process, ‘Sugarpop’ is an indica dominant strain with a specific, beautiful look. Being resistant to various diseases and high temperatures, ‘Sugarpop’ is quite easy strain to grow indoors and outdoors. Its taste has the characteristic, sweet, flavour of ‘White Russian’ with noticeable, earthy-like taste of ‘Kalijah’. Fruity Jack – the genes selected to obtain this model come from ‘Respect #13’ – the 2012 Spannabis winner, a result of prominent cross between ‘Juanita Lagrimosa’ and a specific clone of ‘Cannalope Haze’. The genetics of ‘Respect #13’ were subsequently improved with ‘Jack the Ripper’ reversed male – a sativa plant with relatively short flowering time. The result – ‘Fruity Jack’ is a 65%/35% sativa dominant strain with particular ‘haze’ effect in both taste and flavour. Guava Berry Kush – after successfully mixing of three cannabis species: Chemdog, Afghani and Chem91 by Philosopher Seeds, our collaborator Reggae Seeds decided to develop the strain even further. After a long time of strain selection ‘Juanita La Lagrimosa’s’ genes were added to the multi-genetics model resulting in a new cannabis species – ‘Guava Berry Kush’. The strain is characteristic for its specific smell and taste, what was achieved by a cross with ‘Juanita La Lagrimosa’. Due to its woody, earthy taste, ‘Guava Berry Kush’ is a strain that every serious grower should try at least once. Spicy CBD – the first step of creating this strain was to select a particular female plant of ‘Respect #13’ (a hybrid of genes from ‘Juanita Lagrimosa’ and ‘Cannalope Haze’). With the purpose of improving its already strong taste and aroma, selected strain were once again backcrossed with ‘Juanita Lagrimosa’ what led to the creation of ‘Spicy CBD’. The effect of smoking this species is usually described as relaxing and giving a calm state of wellbeing. Sweet Love – a cross between famous ‘Juanita Lagrimosa’ of Reggae Seeds and our Tropimango. A strain created during a long breeding process stands out for its medical properties and organoleptic features. This 60/40 sativa dominant plant grows notably tall with dense bud produced on central cola with wide branches on lower levels looking similar to a Christmas tree. Finishing quite early, not later than 60 days, ‘Sweet Love’ gives its users nice, relaxing high.